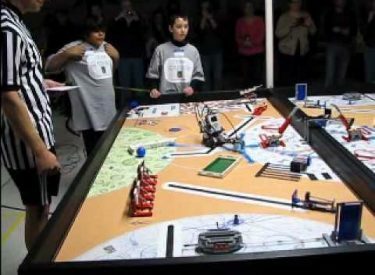 The Mid America Air Museum will be hosting the Annual Kansas Southwest Region First Lego League Championship. The event will take place Saturday, March 23th with the doors opening up for team check-in at 7:00am. Opening Ceremonies will commence promptly at 8:15am. Teams from Oklahoma, Kansas, Colorado, and Texas will compete in this Robotics Competition. The event is free and open to the public with admission to the Air Museum also free for the day. During the morning hours, the teams will be making presentations before a panel of judges and fine tuning their robots for the afternoons table competitions. These will start at 12:30pm. There will be concessions on sight. The theme for this years event is “Into Orbit”. Lego Teams will have constructed a robot from Lego’s, with the Projects mission in mind. The students have been asked to research and solve real-world problems related to Space. Awards will be presented at the end of the day for: Robot Design, Robot Performance, Project Awards, Core Values, and the Champions Award. There will also be activities for children ages 6-10 through the First Lego League Jr. Division with their theme being “Mission Moon”. For more information, or to volunteer, call the Mid-America Air Museum at 620-624-5263.